I shaved for the first time today. Oh, I have dragged some thin pieces of metal across my face to drag the stubble out of its hiding places, but that’s not shaving any more than wiping a depilatory over my lip would be. To learn to shave, I am going to have to pay in blood. We have gotten more and more separated from the act of shaving with advance in technology. It’s no different than the separation we feel from our food production and the weather. While we are more comfortable, we’re also less connected. The idea of shaving with a real blade was first introduced to my mind by the book Lord Foul’s Bane . In it, the main character uses the ritual of shaving as a way to remain in the moment, because to do otherwise can lead to slitting one’s own throat. That’s what razor shaving brings to the table: focus, and patience. This is not quickly getting rid of the scruff before gulping back a cup of coffee and dashing for the train. 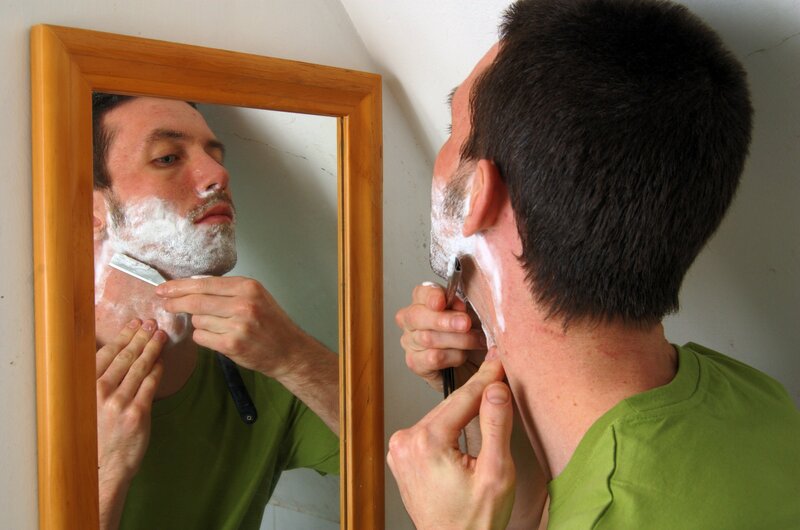 To shave with a blade demands making the time to do it properly, and free of distractions. You can’t hurry it, and you can’t take shortcuts. Every time you try is going to give you immediate feedback. For my first attempt, I decided to buy a shavette, which has replaceable blades instead of one that I sharpen. My research into blade selection made me realize that I could spend a couple hundred dollars on a quality piece of honed steel, without knowing if I would use it more than once. The shavette is a compromise; I will not get as close a shave, but I will be able to master the technique. I can, and have, get cut just as easily. I’ve got a hundred blades. Even if each blade is only good for one shave (which is possible), that should get me through the hundred-shave learning curve. That’s what it will take to master this shaving system, and that’s another bit of magic that it offers me: discipline. I can always use a bit more discipline. By the time I discard that last blade, I’ll definitely know if investing in a real straight razor is worth it. Looking at my first shave, I have a long way to go in the next 99. I can’t figure out how to hold the blade so it doesn’t block my view of the mirror half the time. There’s a section of my chin that I can’t figure out the correct angle for, so I barely touched it. And while having a mustache helps me avoid the tricky area under the nose, I still have to learn how to shape it with unfettered steel. I ended up going over some of the hard parts with my disposable. So in a year or so (I am far from a daily shaver), I may well be a pro with my blade, or I may have thrown in the towel. Along the way I should learn to slow down, pay attention, and keep the styptic pencil handy. This post is part of the Pagan Blog Project, a yearlong exploration of spirituality. This specific post is brought to you by the letter R.
The title of this post is my desperate attempt to find a word to describe my problem. Yes, I’ve got a problem, and no amount of fruit is going to resolve it. I need something a bit more substantial, because my problem is with blank books. Blank books beg promise much, but expect even more. It starts out innocently enough. You see one at a shop, its cover revealing nothing of the contents, the leaves thick against each other, like meaning yet unknown. Maybe it had a leathery smell, or a really exotic fastener. You discover you like them. Of course, just liking blank books isn’t enough; that’s just a taste for a thing, not a problem with it. Unfortunately, people in my life, the kinds of people who choose to give me gifts, also know I sort of like them, and they also know that I like writing in them. So what’s the problem, you ask? I like blank books, I like writing in blank books, my loved ones like gifting me with blank books . . . sounds sweet. It is, and let me be clear — I do feel blessed by it all. They really are full of promise, and I’m not the sort of person who is intimidated by the idea of screwing up the perfectly blank pages. 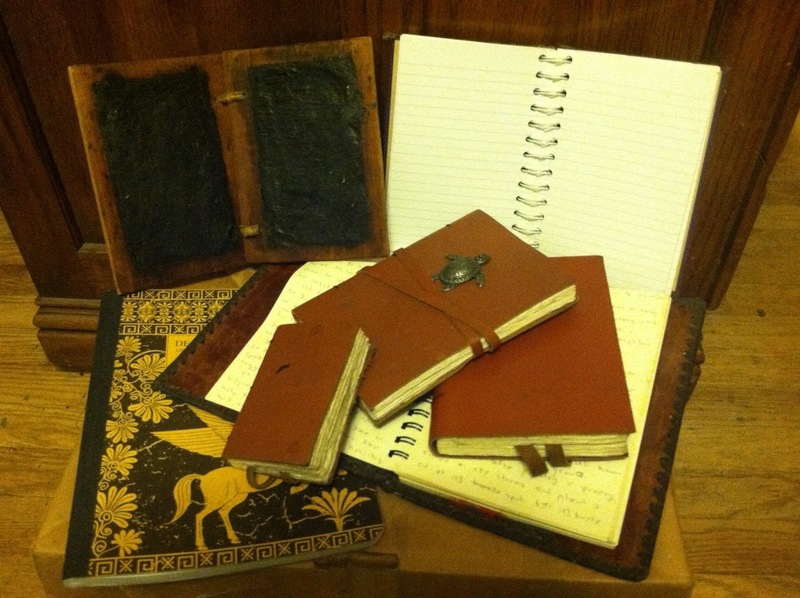 My desire for blank books isn’t waning, and my ideas for their uses are not running short, but still, there are problems. Shelf space, for one. Remembering what they’re all for, for another — it seems so gauche to scrawl its subject on the front, as if it were a common middle-school notebook. Then, there’s the various systems of writing and note-taking that I use in each one; I tend to experiment, and I can forget which one is used where. Somewhere at the intersection of magic and writing are a group of bibliorasaphiliacs, people like me. Please be patient with us as the half-filled books around us multiply at alarming speed. There are worse problems to have, after all. you have a body without a head. you have a body and neck. you have a language without. 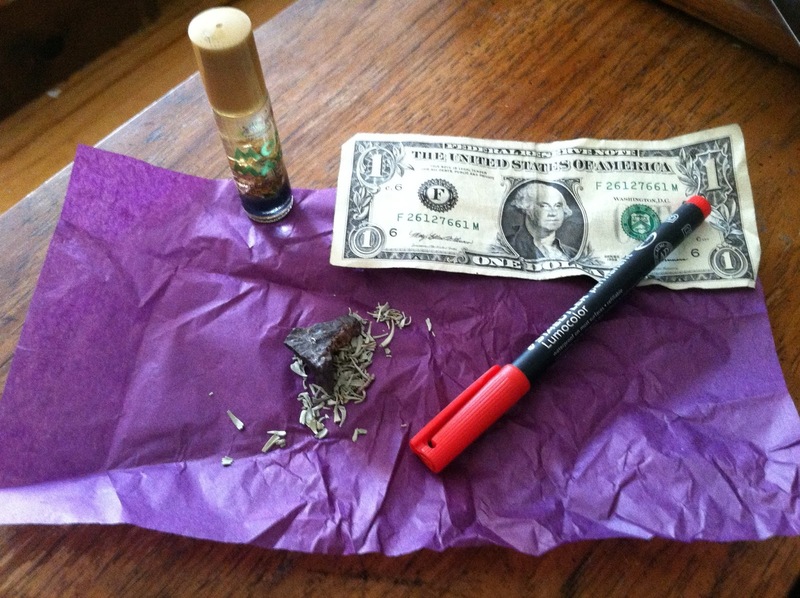 Learned hoodoo practitioner Kirk White gave me the details of a money-hunter spell a few weeks ago, and I’m all set to try it. This particular spell is the first I’ve encountered that seems to depend upon some of the hidden laws of money behavior, so I figured I have to check it out. In each corner of the bill, write the instruction “return to me” (also can be abbreviated RTM) or the sigil $$¢¢$$ (for success). Sign your name over the signature of the treasury secretary (this will need to be tweaked if your country’s money is signed by someone else). Anoint the corners and center of the bill with oil. Place a lodestone atop the bill, on your working altar, for seven days. More money will return to you. Using a larger number of bills, repeat steps 1-5. My local witchy shop was conflicted about the lodestone — their database said they had it, but no one had seen any shipments of the stuff in months. After recommending places to order it online, I got a call back saying that, lo and behold, a stash of 30 or so pieces were unearthed, as it were! I scooped one up and then, they released the hounds. I owe Hermes another dollar for that one, come to think of it. They also sell their own “money magick” oil, which I thought was appropriate as anything. Please comment or link back if you try this out, and let me know the results. This post is part of the Pagan Blog Project, a yearlong exploration of spirituality. This specific post is brought to you by the letter P.
Question: are there polytheistic Quakers? 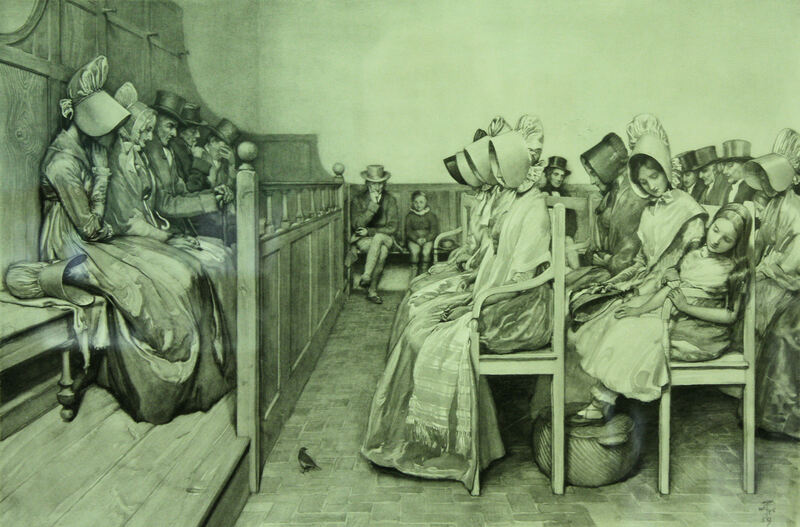 I’ve been attending my local Quaker meeting off and on for a few years now. Joining in worship, I have had profound experiences, which have both deepened my faith and reawakened my appreciation for paradox. Nearly everything I know about the Society of Friends, its organization and theology, come from my Quaker Pagan friends. This certainly gives me a perceptual bias, one that is not universally held. My limited experience does not qualify me to even comprehend that debate, but I am mindful that I am a guest in this meeting house. For my own part, I am very pleased that I decided to join the meeting for worship one summer day. In the silence, I have found that it’s difficult to quiet my own “monkey brain,” as Cat Chapin-Bishop calls the cluttered head, but when I do, I am awestruck. How weighty Friends do it, I don’t know, but I seek that inner silence with a stern admonition to WAIT. Sometimes it takes several reminders, and there are days when I just need to decompress and have no chance of success. On some occasions, though, the extraneous thoughts about imagined snubs and to-do lists fall away, and I become aware of what Quakers call the Light. The experience is one of understanding, of communication, and of revelation. Images and insights answer questions that I have lifted in prayer to one or more of my gods, or that I have asked through divination. Snippets of my life get assembled in different ways, such that new patterns and purposes become evident. Sometimes, I feel the presence of a particular god, but that’s not the norm. The idea of pantheist and nontheist Quakers makes a certain amount of sense to me, if one accepts the premise that Jesus is but one of many possible conduits of the Light. But I’m a polytheist, darn it, and that there Light feels like a different entity to me. That’s where paradox comes in: just because I see the gods as separate and distinct beings, doesn’t mean that “all gods are one god” is not also true. So perhaps the Light is representative of that paradox. Or it’s a deity unto itself. Or neither, or both. So I wonder: are there Quakers out there who identify themselves as polytheists? This post is part of the Pagan Blog Project, a yearlong exploration of spirituality. This specific post is brought to you by the letter Q. My research into the Greek gods has drawn me to the conclusion that they are very comfortable with possession. Much of the ancient literature talks about the gods appearing in the form of an animal or person. Is that a sign of their ability to shift shape, or is it more in their character to simply occupy a physical form which already exists? My gut tells me that using what’s there takes a lot less effort than creating matter from energy. I wonder about the forms Zeus and Hermes assumed when they visited Baucis and Philemon, and the old woman Athene becomes to speak with Odysseus and challenge Arachne. Ares is even more interesting: there’s more than a few references to someone “walking with Ares” or having Ares in his heart, and the scholars say that Homer and his ilk were just metaphorically expressing the character’s murderous rage. Why are they so sure it’s metaphorical? Seems to me that the theoi, if not other gods, are more than comfortable inserting themselves into mortal beings. Maybe “possession” is too strong a word, because they influence thoughts and deeds but do not generally take over fully the way a Wiccan or Santeria deity might, or someone in an oracular trance. But possessing part of me is still a form of possession, so I like the word for it. Words spoken by a stranger on the road may be an omen. Could that be because a god alighted just long enough to take over the tongue at that moment? I give money to beggars as an offering to Hermes. Isn’t it likely he is present to accept it personally? My knees knock and my heart pounds when I am faced with physical confrontation: is Ares bringing my adrenaline to the fore? If we were possessed by our gods in little ways, every day, would we simply feel closer to them? Do we need more words to describe the range of states that I see as possession? International Pagan Coming Out Day has come and gone for another year, and left me with a surprising question: am I a Pagan at all? What I have seen as I ponder this question is that the people who cleave to the term tend to hold Wiccan beliefs, or have been influenced by Wiccan practice. I certainly am among that crowd — while I was only a practicing Wiccan for about three years, my early adulthood exposure to Paganism included many conventions that Wicca gave to the world, such as casting a circle for sacred space, associating the four elements with the four directions, and a dualistic worldview. Others whom I deem Pagan eschew the term: practitioners of indigenous religions like those still found in some Native American tribes, or reconstructed faiths like Heathenry, Hellenismos, and Kemeticism in particular frequently don’t see themselves as Pagan. It could even be most, but it’s certainly not all; I still view myself as Pagan despite my desire to better reconstruct and perpetuate ancient Greek religion, and I am not alone in labeling myself in that manner. So now, I consider whether it’s appropriate to continue. So we have religious movements in which some members identify as Pagan and others do not, while their practices are largely the same. My sense is that the folks who avoid the term feel like it’s been foisted upon them, and perhaps more importantly, that the word “Pagan” pretty much means Wiccan, which they are not. Depending on the individual’s history, it may even echo the oppression that men, or whites, or some other dominant group imposed upon them or their ancestors. Wiccans will tell you, almost to a fault, that their religion is but one Pagan path, but is it? Despite the intent of the word, has Pagan largely become a synonym for Wiccan? What has certainly happened, as is evident at gatherings, is that Wicca has heavily inspired the common language of Pagans. Not every religion uses circles and quarters, but nearly all rituals at festivals do so. Most are not actually Wiccan rituals, but many of the symbols of Wicca are used. It’s kind of like when I was a Boy Scout, and we’d hold a “non-sectarian religious service” on the Sunday morning of a camping trip. The Scoutmaster or other adult would lead us through a series of prayers that honored both Protestant and Catholic belief. If we’d had a Muslim boy in our troop, he may not have seen it as quite as inclusive, but growing up Catholic, I didn’t know any better. Some of my best friends are Wiccan, to borrow a phrase, but I’m not. I don’t feel like I’m on the outside of the circle when one is cast, but I understand how some people could be. How does it feel to be a member of the minority religion in a gathering of minority religions? Is it important to include all the worshipers of all the gods under the Pagan umbrella? Well, maybe. Probably. There is safety in numbers, and even together, our numbers are small. It’s illegal to worship Greek gods in Greece. People are still being killed for suspected witchcraft in some parts of the world. A temple in Catskill, New York is being denied tax exemptions that Christian monasteries enjoy all the time. Pagan Living TV, created to advance an accurate perception of that very word, failed in part because of the resistance its organizers have faced to That Word. Oppression is very real, and our voices are small. Despite the fact that our differences are greater than those found among the Abrahamic faiths, which stem from a single patriarch, there remain certain commonalities among our faiths. Finding those common threads strengthens our ability to lift each other up and resist defamation and oppression. I still consider myself a Pagan. I have been a following of Herne and the Green Man, an initiated Wiccan, a sacred backpacker, and follower of the Greek gods. What stays the same is my Pagan heart, no matter my outward practices. But still, I think it would be better to see Pagan, not as an umbrella, but as a language. Esperanto was created to be a universal language, but we got stuck with English, which is clunkier, but spoken by far more people. Pagan is like English, but wishes it were Esperanto. The language is sometimes awkward because it has a lot of built-in assumptions, invisible to Wiccans and near-Wiccans, obvious to anyone else. However, it’s a language which is at least passingly familiar to all the polytheists, Hellenes, Kemetics, Heathens, hedge witches, and many others; we may not all identify as Pagan, but Pagan is a better tool for communicating amongst ourselves than has been otherwise adopted. This post is part of the Pagan Blog Project, a yearlong exploration of spirituality. This specific post is brought to you by the letter L.